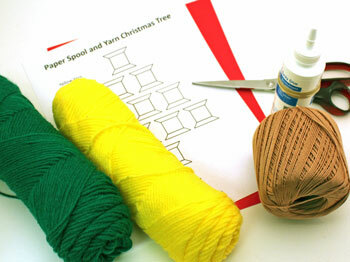 This Easy Christmas Crafts Paper Spool Tree looks like real spools when on display. It's an inexpensive, fast, fun and easy project to do using a few simple, inexpensive materials and tools. 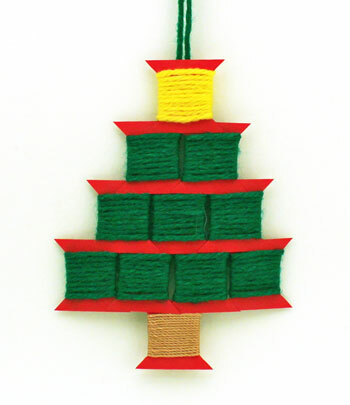 This paper spool tree uses different yarns to look like thread wrapped around the spools. But, you could also use fabric scraps or paper instead of the yarn. 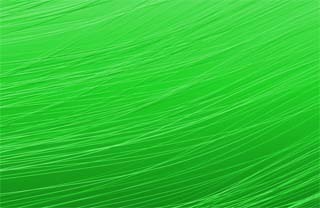 The materials and the tools are simple and inexpensive. You can make just a few or many in a short amount of time. 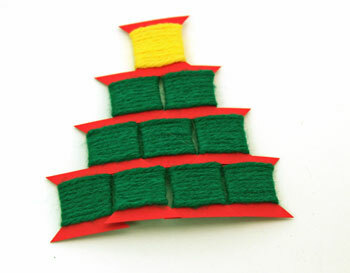 Take a look at the fun little Easy Christmas Crafts Paper Spool Tree. The paper spool tree is simple, fun and interesting. Print the Paper Spool Tree pattern. I used an 8 1/2 x 11 inch red card stock and printed the pattern directly on the card stock. You could use other types of heavy duty paper. 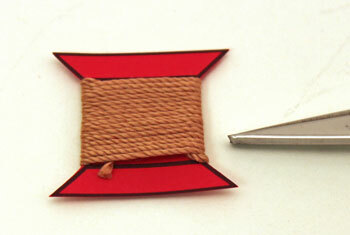 For example, red poster board or glue red construction paper on chip board. Cut around the spool shape to make 11 spools. On the back side of the spool begin wrapping the yarn. The wrapped yarn can hold the end. 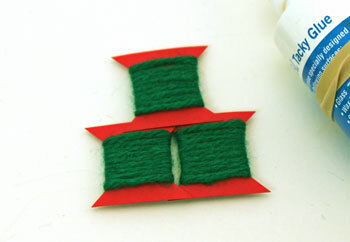 If you prefer, add a bit of glue to hold the end in place before you begin wrapping the yarn. Continue wrapping the yarn. 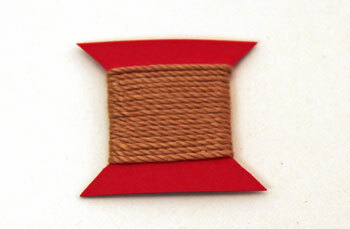 Make sure the yarn is close together like that of a spool of thread. When the area is covered, clip the yarn one inch beyond the edge and tuck the end under the wrapped yarn on the back of the spool. The wrapped yarn will hold the end. 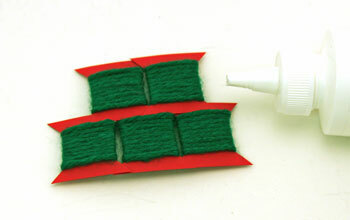 If you prefer, add a drop of glue to the back to hold the yarn. 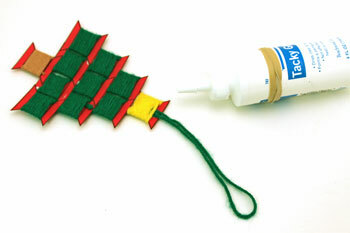 The front of the paper spool looks very similar to a thread spool. 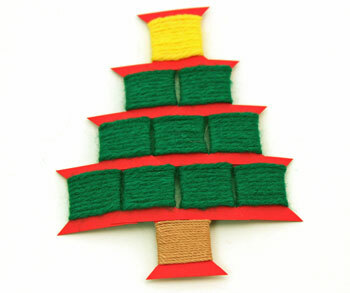 Wrap each of the spools - one brown, one yellow and nine green. 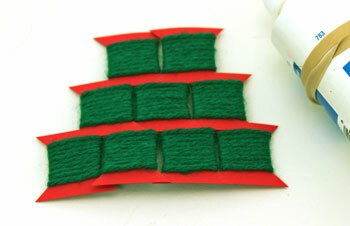 You can also use fabric scraps or paper scraps instead of the yarn. Begin gluing the spools together. Overlap the points of two spools side-by-side. 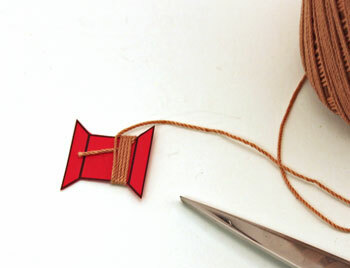 Add a third spool centered over the two spools and place its edge over their lapped edges. Add glue to hold the spools together. 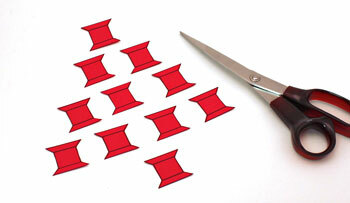 Add two more spools overlapping side-by-side points and edges. Glue the spools' edges together. 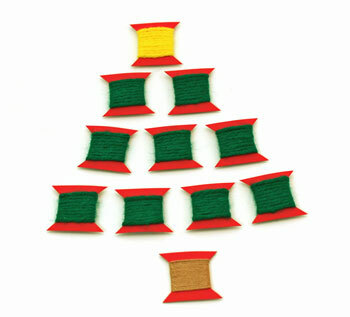 Add another two spools to complete the widest two rows of the tree. Glue the two spools to the top edge forming the narrow tree row. Add the yellow spool centered above the top two green spools. 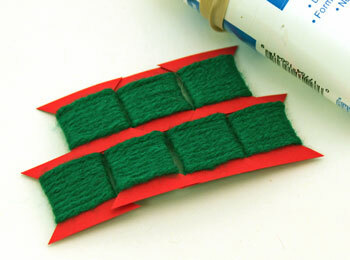 Glue the points together along the bottom of the four green spools. Add the brown spool to the center of the four green spools. 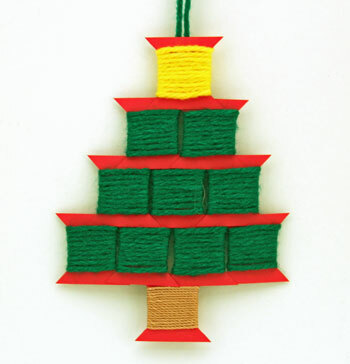 Glue a loop of yarn to the back of the yellow spool to hang the simple and fun paper spool tree. The little paper spool tree looks like it's made using real spools. The little tree measures just 4 x 5 inches. Whether young or young-at-heart, people of all ages can enjoy this easy Christmas crafts project and add their own unique character to the little tree. Using a few inexpensive materials and tools this Easy Christmas Crafts Paper Spool Tree is simple, fun, fast and inexpensive to make.